This is a Real-Time Computer Strategy Football Game. With Computer Quarterback football, football season need never end. You can form your own teams, even start a full-fledged league with your friends! From its multiple offensive/defensive plays and its real-time playing conditions to the semi-animated video display and the halftime statistics, this strategy football game has plenty of detail and exciting realism! This box contains $3 million for you to draft and coach any football team you like! 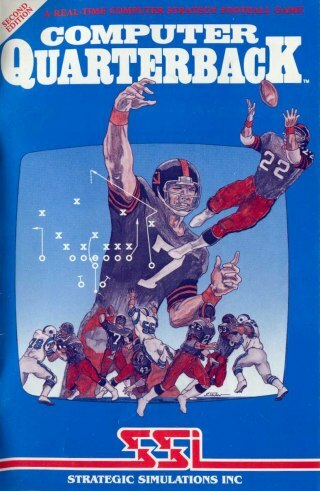 When Computer Quarterback was first released, it generated rave reviews. Now, this second edition makes a great game even better- with its added features so it's even truer to NFL football. This abridged version gives you 18 offensive and 14 defensive plays so you can learn and practice the intricacies of strategy football. On offense, you'll learn to read the defense, and call audibles as needed. On defense, you'll need to shift constantly to anticipate and confuse the opposition. - 36 Offenses with all the runs, traps, draws, screens, passes, and trick plays you need to move your team into the end zone. - 24 Defenses that include man-to-man and zone coverages, blitzes, double-teaming capabilities and special assignments. This is the formidable team coached by the Computer. It's ready to play any time you are, and it plays one mean game. It even "learns" your tendencies and patterns through time and makes the appropriate tactical adjustments. The computer also eliminates all organizational drudgery. It plays scorekeeper, referee, umpire, and linesman. As timekeeper, it makes you play in real-time. Take longer than 30 seconds to hike the ball and you'll be penalized five yards for delay-of-game. As a separate option, SSI offers several Data Disks containing statistics of recent NFL teams. With them you can re-create memorable games, real or imagined, of past seasons. With Computer Quarterback football season need never end. You can form your own teams, even start a full-fledged league with your friends! From its multiple offensive/defensive plays and its real-time playing conditions to the semi-animated video display and the halftime statistics, no strategy football game has ever been more complete in detail or as exciting in realism!